1929: Girls are going missing in Melbourne. Little, pretty, golden haired girls. And not just pretty. Three of them are pregnant, poor girls from the harsh confines of the Magdalene Laundry. People are getting nervous. Polly Kettle, a pushy, self important Girl Reporter with ambition and no sense of self preservation, decides to investigate and promptly goes missing herself. It's time for Phryne and Dot to put a stop to this and find Polly Kettle before something quite irreparable happens to all of them. It's all piracy and dark cellars, convents and plots, murder and mystery .... and Phryne finally finds out if it's true that blondes have more fun. I really should be used to the differences between the books and TV episodes by now. The episode inspired by this book bears almost no resemblance to the book. Basically, all they have in books common is missing pregnant teen girls. So, the book. Phryne encounters a female reporter and finds herself getting involved in the case of some missing poor, young girls. Then the reporter goes missing. And soon, Phryne and her crew, or minions as she likes to call them, are on the hunt and up to their necks in white slavery, slave labor, virginity tests, child marriage, sexual abuse, kidnapping, and a socialist-inspired fruit farming collective run and worked by females only. There's a lot going on and at times my attention wandered but Phryne and minions were full of life and opinions and passion. Phryne is more self-centered and sybaritic than in the TV show and at times, I thought she needed to woman up and be less indulgent but she never backs away from doing what she thinks is right and enacting her own version of justice. When you are in trouble, Phryne Fisher is just the woman to help you. Provided she thinks you're worth helping. Greenwood has beautifully developed the relationships in the series. They're layered, rich, and complex. She weaves politics, economics, social issues, a hint of romance, humor, and mysteries into a brew that's dark wit a hint of sweet, rich, and engaging. 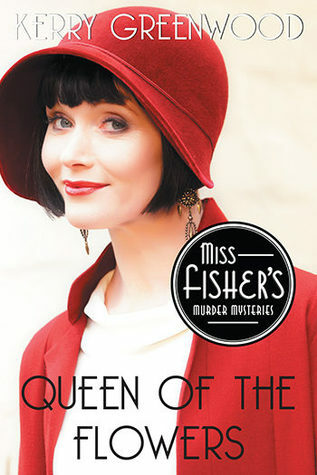 "Miss Fisher is a force of nature and there is never anything you can do about her." "Well, darling, one does not like to watch a nice little woolly baa-lamb go leaping and gamboling into a field full of large bitey wolves. It has a certain morbid interest, I agree," said Phryne, sipping deeply. "But it is basically a blood sport and I don't even like fox-hunting." The egg whites, apparently, had completely declined to be whipped. ...but Jane's writing looked like an intoxicated inky spider had staggered across the page on the way to the bar for another drink. Which it really didn't need. Oh, I liked this one a lot. So much better than the TV episode based on this book. The more I read, the more I fall in love with this series. Circuses, parades, family drama, romances, loyalty and friendship, secrets, kidnapping, missing children, familial love, old lovers, current lovers, wines, continental gentlemen, brothels - it's a lot but it was a delightful mix. Miss Phryne Fisher does not lead a boring life, lol. Phryne and minions are preparing for a parade where Phryne will be the Queen of Flowers and her attendants are young girls from moderately good families. But there's tension between the girls, they are keeping secrets, and then one goes missing. As Phryne investigates, she encounters an old lover, and one of her adopted daughters goes missing. There are several story threads; some come together quickly while others take longer to play out. There's a lot of family drama, both in Phryne's life and that of the missing flower attendant. It hit soap opera levels at times but I enjoyed it. There were some slow bits but overall the pacing was good. The cast of characters is large and not every one appears in every book. Inspector Jack Robinson and his wife make an appearance but Jack's role in this book is less police officer and more friend. Lin Chung, Phryne's married lover is back and plays a somewhat larger part. I'm still not okay with Phryne being involved with a married man but I'm slowly getting used to him. I had a hard time believing how comfortable Lin's wife Camellia was with the situation; it doesn't strike me as realistic. It also feels unrealistic that Phryne doesn't suffer social consequences for her affair. Other than, I enjoyed the book. In fact, I think it might be one of my favorites. "Queen of the Flowers" has Greenwood's usual rich and complex storytelling with fascinating, vibrant characters, extraordinary and ordinary circumstances, and strong, wonderful relationships. I enjoy the latter as much as the mysteries. And the worlds that Phryne walks through - high society, low society, mundane and dramatic, and everything in between. 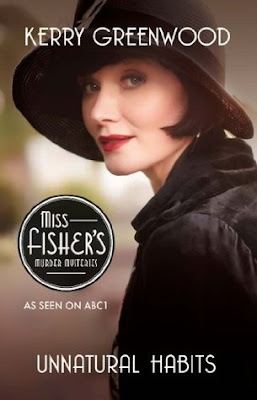 I also love that I always learn something when I read a Phryne Fisher books - a bit of history, social issues, fruit farming,life in different parts of the world, the inner workings of a newspaper in the 1920s - there's always something interesting. The elephant was the last straw. "There are good sailors,"said Phryne. "Well, some good sailors. In a way, they are ideal as husbands. They drop in every six months for a wild celebration, then they drop out again, before one gets bored with their company or annoyed by their habits."